This weekend I attended the Seventh Midwest Bike Polo Champeenships hosted for the first time in Columbia, Mo. by COMOPOLO and wrote a story and crafted a multimedia slideshow for the Missourian, which published the video and the accompanying story online earlier today. Boone Life: Come to CoMo for Bike Polo from David Kennedy on Vimeo. 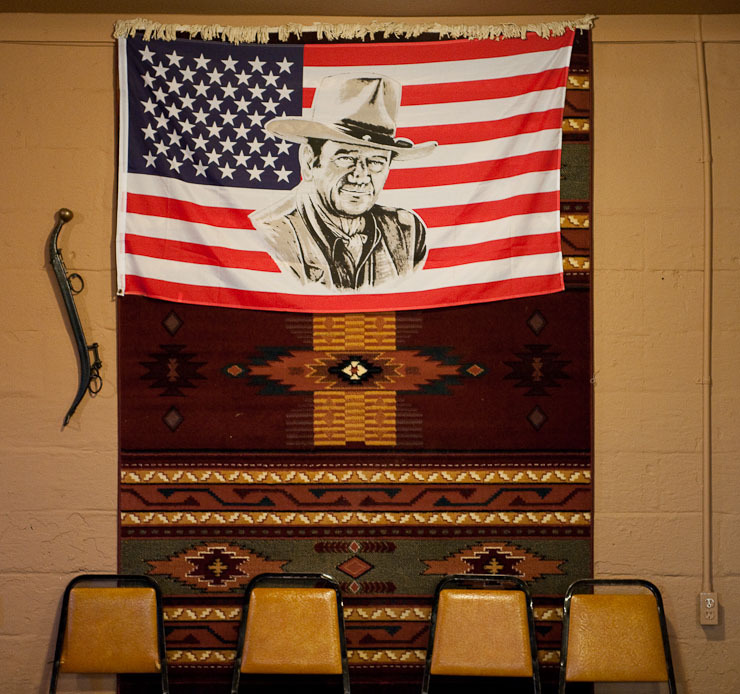 A John Wayne American flag hangs on the back wall at Lucy’s on September 24, 2009 in McBaine, Mo. I’m presently working on a story for the “Boone Life” photo column in the Columbia Missourian. While the story is not yet finished, I thought I would share a detail from the diner where I’m developing something to fit our new theme: beginnings. In this case, how people begin their days in the small town of McBaine, Mo., population 12. I’ll link to the story when it is finally completed. The final story went online last Tuesday while I was at the Missouri Photo Workshop, and can be read on the Columbia Missourian’s Web site. Boone Life: Rain or shine, farmers shoot the breeze at McBaine diner from David Kennedy on Vimeo. 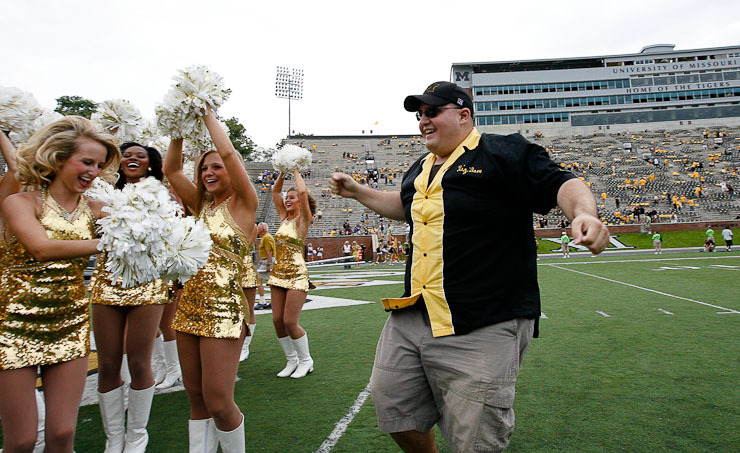 David Champlin of the "Big Mo" drum crew, who lead the MIZ-ZOU cheers at football games, celebrates the Missouri Tigers' victory over the Furman Paladins with the Golden Girls at the end zone of Faurot Field on Saturday, September 19, 2009 in Columbia, Mo. The Tigers defeated the Paladins 52-12. / Canon 1D Mark IIN and 16-35mm f/2.8 II L lens @ 16mm; exposed 1/400 sec. @ f/8, ISO 800. This weekend I photographed a college football game–Missouri Tigers versus the Furman Paladins–along with John Schreiber, for the Columbia Missourian. It was only my third or fourth time photographing football, and my first college game, so it was a little different. 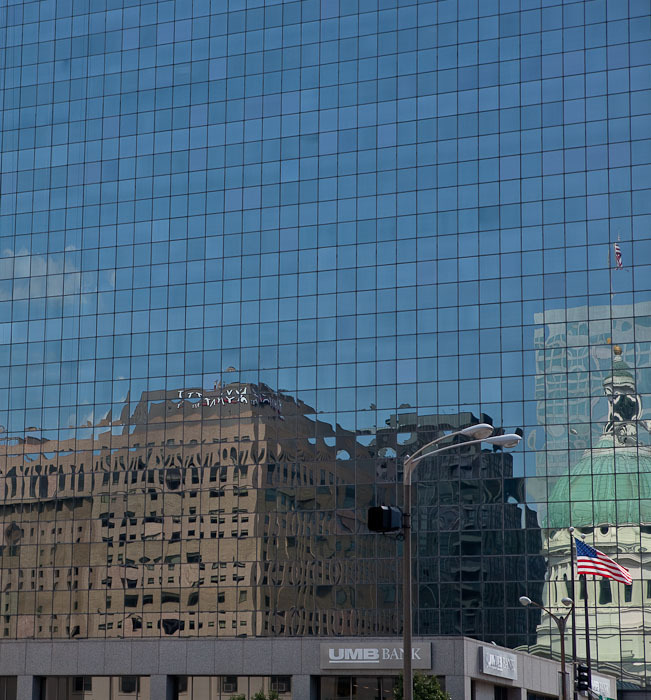 I was also using a Canon 600mm f/4 L IS lens from CPS, which made things extra different. But it was a lot of fun, and there’s a web gallery here. While at the game, I was assigned to get a feature photo of the crew of “Big Mo,” an over-sized drum on a trike that is used to lead cheers of “MIZ–ZOU” at the games, as well as run up and down the end zone with the cheerleaders after a touch down. At the end of the game, David Champlin started dancing with the Golden Girls, who are a more “sparkly” version of the cheerleaders. The result was the photo above. Sadly, it will never find its way into the Missourian, so I’m posting it here for all to see. I suppose it’s better this way. 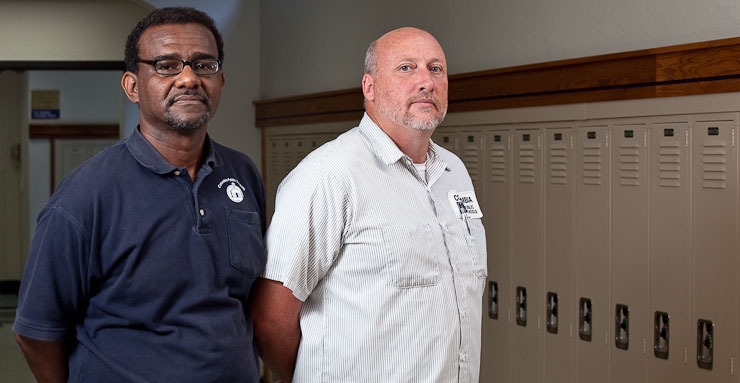 Secondly, I thought I would post this portrait of Anthony Fitzgerald and Arnold Cromwell, two custodians–one from Hickman High School, the other from Rock Bridge High School–to be featured in this week’s VOX Magazine in the “On-The-Job” section. I was happy with the final select, but also felt that the image below worked fairly well. I do wish I had some more time with them to get a moment between the two, but at the very least I feel that this was a respectful presentation of the two men. Anthony Fitzgerald, left, a Hickman High School custodian, and Arnold Cromwell, right, a custodian from Rock Bridge High School, stand in the hallways of Hickman High on Monday, September 21, 2009 in Columbia, Mo. Despite the two schools' athletic rivalries, neither Fitzgerald or Cromwell take it too seriously. / Canon 5D II and 70-200mm f/4L IS lens @ 75mm; exposed 1/160 sec. @ f/8, ISO 800. 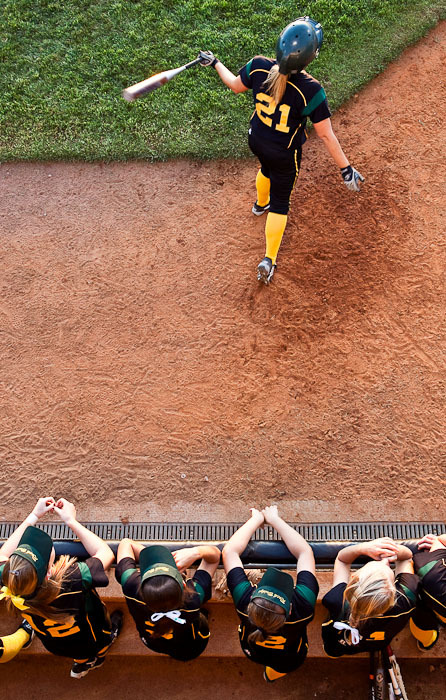 Danielle Linneman, a junior on the Rock Bridge High School varsity softball team, heads off to bat on Thursday, September 17, 2009 at University Field in Columbia, Mo. The Rock Bridge Bruins defeated the Hickman Kewpies 4-0.